Julia has been ripped from the escape she’d planned for herself. When she awakens to discover that her reality has shifted to include a supposed soul-meld with a man she hates… and who hates her, she rebels. Julia doesn’t want to be Queen of the Blood Singers if it means captivity in a gilded cage. Broken from the horrific events surrounding her friends, Cynthia migrates to the very city that Julia resides in and determines to find her as the police follow the bread crumbs she left in her wake. Detective Truman’s discovery at her apartment exposed her departure for the escape it was. The Feral has come full circle and must begin a new life from the shadow of the old. His placement in the hierarchy of the pack is uncertain when he finds that he has an integral enemy already in place and a pack member to protect. While he desperately seeks answers to what had been… what could be. 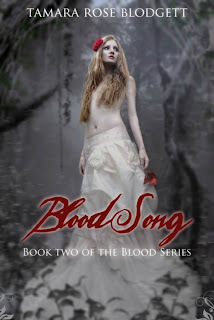 You guys check out the cover and reveal Tamara put up on her blog. So pretty. I love Phatpuppy’s work and this is no exception. Be sure to visit Tamara’s website http://tamararoseblodgett.blogspot.com to look at and buy a copy of the first book in the series Blood Singers book. It is a great vampire read. This book is a wonderful coming of age story. Julia is incredibly strong female character that withstands more than her share of trauma. The book is well written with a very few very small typos but not enough to cause concern or distract from the story at all. The characters are realistic. By the end of the story you feel like you know them. It is definately a new take on a very familiar concept. Who hasn’t read a book about vampires and werewolves? Each group is given equal page time and are amazingly dynamic. I definately was rooting for the vamps in the begining. Then I was rooting for Julia and Adi’s friendship. 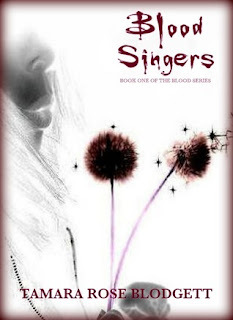 Then I was like ‘yeah go Blood Singers’. Tamara created a new story without rehashing the same ole same. The ending ahh I wanted to keep reading and reading and reading. I was like, seriously, she’s going to make me wait for another book! I know that I will be rereading this before the next books come out! I would say this is another great to start to what is to be another one of my favorite series! I should also mention that this book was a gift from the author. I would have bought it myself and devoured it had she not I love her work that much!! **On another note I would love to welcome our newest blogger Toni. She’s a super reader and suggests awesome books to me all the time. I think she will fit in good around here. Thanks for joining us Toni. Thanks! Thanks! Phatpuppy rocks =) I’m so excited to share!